Your dive or scuba boots can easily be overlooked as an essential piece of dive equipment. Although not as important as your mask or regulator, they are designed to protect your feet in so many ways and is required with most open heel fins. But, with so many style and features of boots available, which is best for the diving you will be doing? In this article, we are going to help you find the best dive boots for your diving needs by providing a comparison table of our top ten picks, as well as a buying guide to help make your choice much easier. What Are The Best Dive Boots? Use the Comparison Chart below to quickly find the best booties for your scuba diving fins. Still Looking For The Right Scuba Fins? Check out our list of the top 10 Scuba Fins available on the market today. Below you will find reviews of the top 10 best dive boots. The dive boots you choose will generally be determined by your personal preference and the type of diving you will be doing. For instance, diving in colder water will require ticker boots than if you were diving the in tropic. 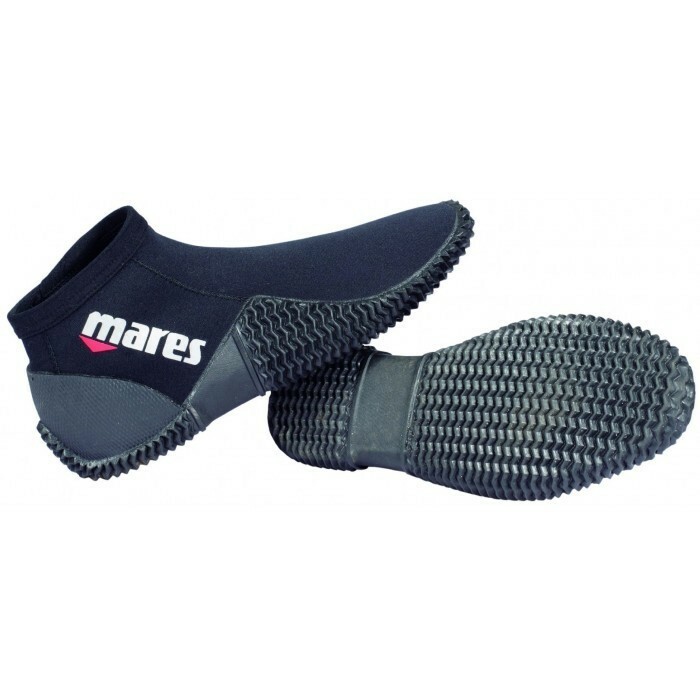 Also, if you’re planning on doing a lot of shore diving then you would opt for a dive boots with a thicker sole. If you’re not sure which works best for your diving needs scroll below to read our guide to choosing the best dive boots. The NeoSprot 5mm Hi-Top Dive Boots are constructed from nylon 2 neoprene making them both strong and durable. 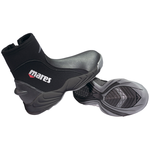 Its durable puncture resistant sole provides a sure grip on slippery surfaces. It also features toe and heel cap for added strength in these high-stress areas. These boots make a great choice for a lightweight and durable boots at a price that won’t break the bank. 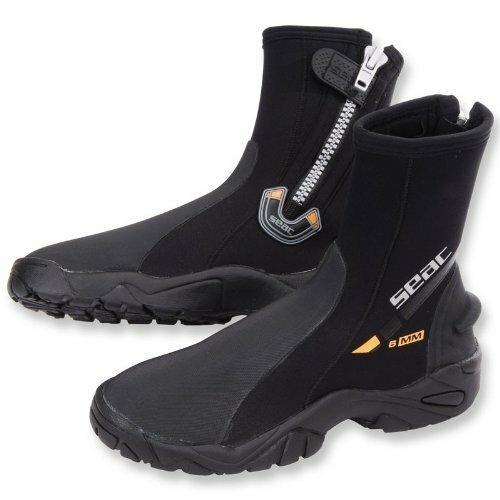 The Seac Pro HD 6mm Boots are tough and durable neoprene dive boots designed to let you get the most out of your dives. It long zipped heal make donning and doffing easy and the integrated heel notch keeps your fin strap in place. While the hard sole makes entry and exiting on rough terrain comfortably. Making it a great choice if you do a lot of shore diving. 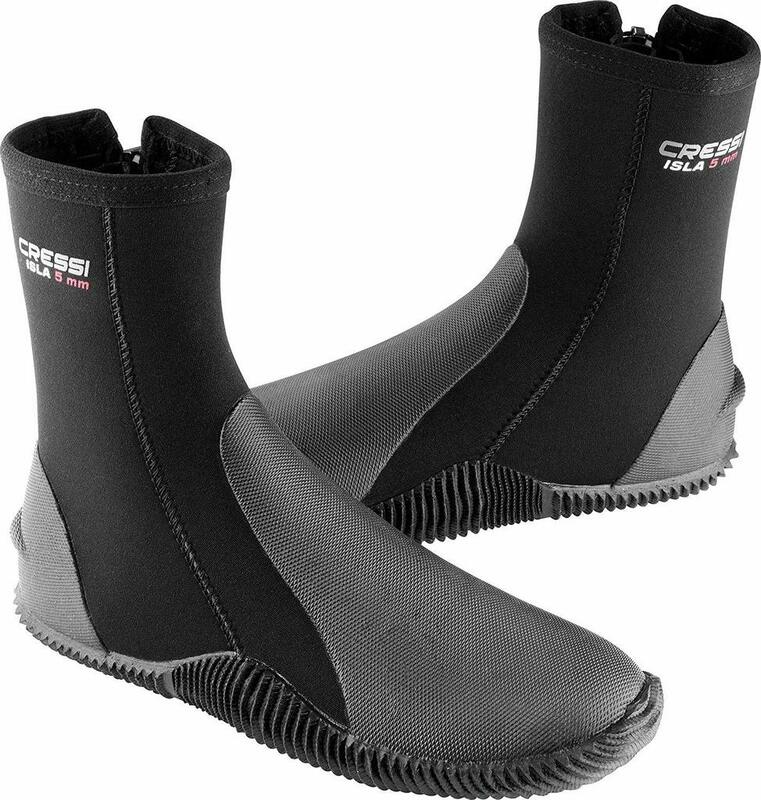 The Cressi Issa Boots are robust and durable neoprene boots that are suitable for all kinds of water sports. 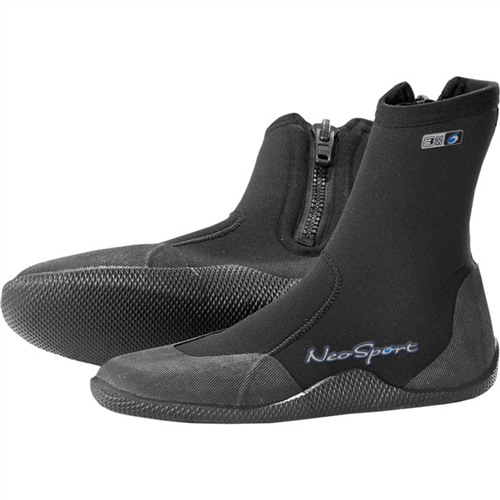 However, features such as reinforced toe and heel at high wear areas, fin strap tabs to prevent slipping, and a long zipper to the ankle for easy donning and doffing makes it a great choice for serious divers. 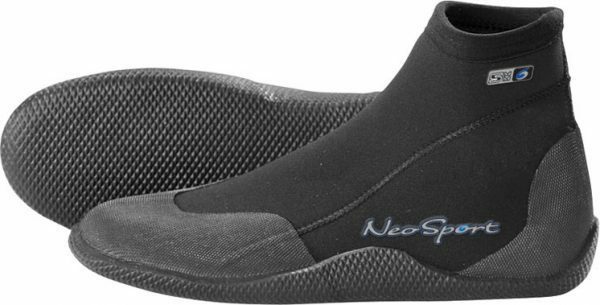 The NeoSport Low-Toop Pull-On Boots are great for warm water dives and also make a great all-around water shoe. Made from nylon 2.3mm neoprene with added toe and heel reinforcement, they are very durable. There is no bulky zipper, making them more streamlined and help prevents heat loss through water seepage. A great choice if you do most of your diving in warm waters of the tropics. 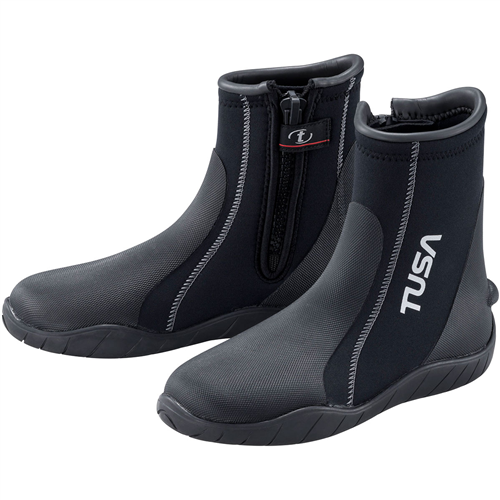 The Tusa Imprex Dive Boots are constructed from 5mm Neoprene, making them at home in both cold or warm water. It has a long zipper which makes it easy to get them on and off and a velcro zipper retain will keep your zipper in place throughout the dive. On the heel, this is a neat strap saver which stops your fins strop from working its way off your heals. A great choice if you’re looking for an all-around dive boots. The Mares Felxa DS boots feature a hard rubber sole with sure grip making getting in an out of the water in any terrane very easy. Toes and heel reinforce make these both very durable and designed to last. It Zipper dam prevent water seepage and it 5mm thick neoprene makes it a great choice for diving in cold water. 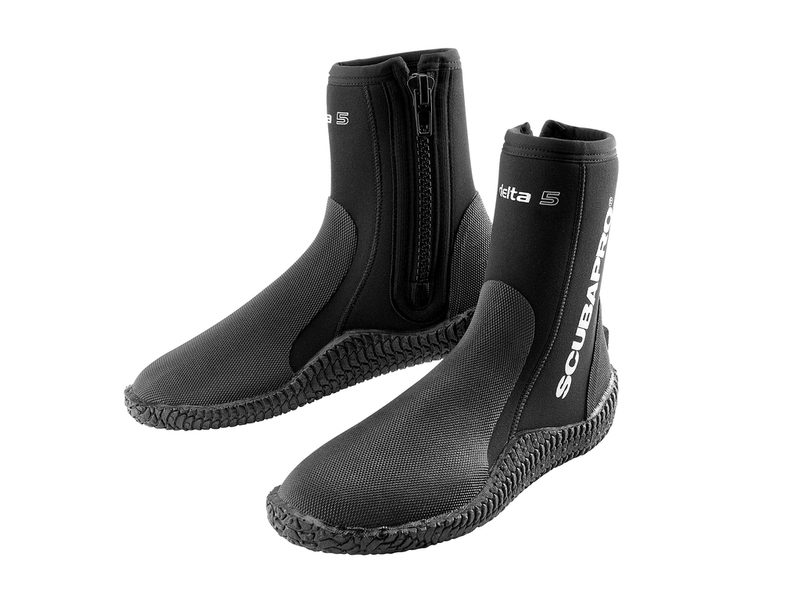 The XS Scuba Thug boots are 8mm thick and designed to be extremely warm dive boots. Its large zipper is equipped with a cold water dam minimizes cold water seepage. While the velcro tab zipper retainer and nylon zipper stop ensure the zipper stay in place while diving. They are extremely well built as well, the seams are glued and double-blind stitched. 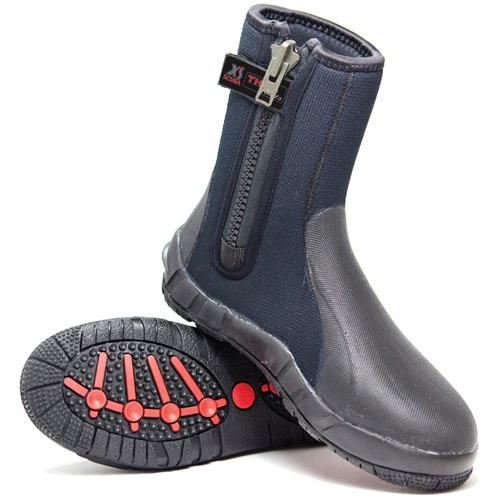 It is the perfect cold water diving boots that are designed to be long-lasting. 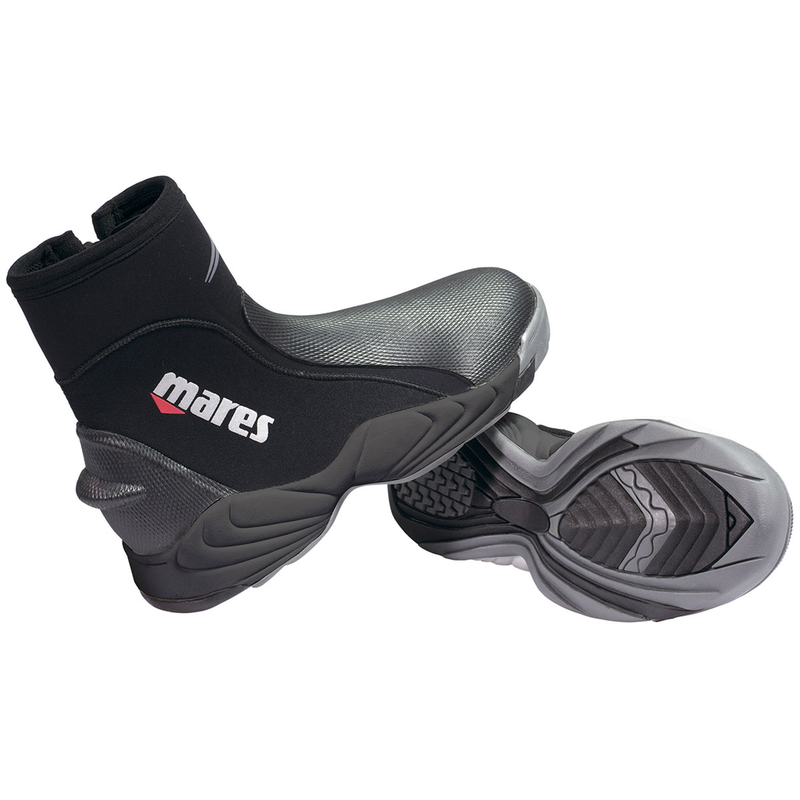 The Mares Trilastic 5mm Dive Boot is a beefy built dive boot with a comfortable sneaker like hard sole. The entire front and heals are reinforced with vulcanized rubber making them very durable and will give you years of reliable service. They are very warm and equipped with zipper dams to prevent water seepage. 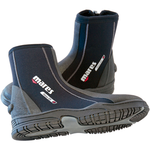 These are great temperate and cold water boots that makes entering and exiting the water in any terrane easy. 5mm thickness works great for temperate and cold water diving. The Scubapro Delta Dive Boots are quite versatile and great for temperate and cold water diving. It 5mm nylon 2 neoprene and zipper with internal gusset deeps water exchange to a minimum keeping your feet toasty warn though your dive. Its durable construction also ensures that you will have them for many years to come. Overall its a great all-around dive boots for the seasoned diver. If you are planning to dive with open heel fins, having the right dive boots will let you dive more efficient and comfortable. But, before you go ahead and buy just any boots, there are a few things you need to know before making your choice. The first thing you must do is determine how thick your dive boots must be. They are generally made from the same material as your wetsuits and comes in pretty much the same thickness. Generally, the thickness of your boots is determined by the type of diving you will be doing. For instance, if you are diving in tropical waters, then you will require booties with thinner material, about a 3mm should do it. But, if you are diving in cold water, then you will defiantly need a dive boot 5mm and above. The general rule of thumb is to wear the same thickness booties as your wetsuit. The type of sole will also be determined by the type of diving you intend to do. If you generally dive from a dive boat, then a thin sole would be sufficient. 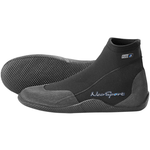 However, If you will be doing a lot of shore diving, then you will need to buy booties with a thick sole to help you walk over sharp rocks and obstacles that would penetrate thinner soles. The cut of the dive boats is also very important as well. If you’re going to be diving in warm water then a low to mid top would be sufficient. For cold water diving, you will defiantly need the added protection of a high top. The high top also provides additional ankle support, which is well needed when walking with all that heavy scuba equipment. Your scuba boots can be fastened many ways, the more popular are zippers, velcro strap, or simple slip-on. Zipper fasteners make putting on your boats very simple but can leak water inside the boots without a zipper well or gasket. This can make them less effective in cold water. Velcro strap and tabs keep your boots warmer and also allow you to adjust the fit to your liking. Silp-on boots make putting on and taking off your boots very simple and can provide a comfortable and snug fit. However, they are generally found on low to mid top boots making them more ideal for warm water. Your dive boots require very minimal maintenance. It is pretty similar to how you would care for your wetsuit. Simply rinse and soak them in fresh water for a few minutes. Allow them to dry thoroughly, then store them in a clean dry place out of direct sunlight.